Possibly a member of the de Rothschild family, Vienna, from about 1850. Baron Louis de Rothschild [1882-1955], Vienna, probably by inheritance, by 1931; (Rosenberg & Stiebel, New York, put on consignment with M. Knoedler & Co., New York, May, 1947; transferred to Knoedler's regular stock in June with a portion owned by Rosenberg & Stiebel); purchased February 1952 by the Samuel H. Kress Foundation, New York;  gift 1961 to NGA. Not verified, but likely; stated in Ludwig Baldass, "Ein Frühwerk Hans Holbeins des Jüngeren." Kunstchronik und Kunstliteratur. Beilage zur Zeitschrift für bildende Kunst. 7/8 (1931): 61, and in M. Knoedler & Co. invoice of 6 February 1952 in NGA curatorial files. This painting was confiscated by the Nazis from the Louis de Rothschild collection in Vienna in 1938 and was destined for Hitler's planned museum in Linz, Austria. It is listed on the 20 October 1939 Vorschlag sur Verteilung der in Wien beschlagnahmte Gemaelde: Fuer das Kunstmuseum in Linz prepared by Hans Posse, and also his Verzeichnis der fuer Linz in Aussicht genommenen Gemaelde dated 31 July 1940 (OSS Consolidated Interrogation Report #4, Linz: Hitler's Museum and Library, 15 December 1945, Attachments 72 and 73, National Archives RG226/Entry 190B/Box 35, copy NGA curatorial files. See also Linzer Kunstmuseum list, National Archives RG260/USACA, Records of the Reparations and Resitution Branch, Box 158, item no. 1112, LR 5). Letter of 10 April 1987 to John Hand from Gerald G. Stiebel, Rosenberg & Stiebel, in NGA curatorial files, gives their source for the picture as the Vienna Rothschilds. Knoedler stock book no. 10, p. 34, no. A3695, M. Knoedler and Co. Records, Getty Research Institute (copy NGA curatorial files). Knoedler stock book no. 10, p. 34, no. A3695 and sales book no. 16, p. 383, M. Knoedler and Co. Records, Getty Research Institute (copies, NGA curatorial files). Seventeen Masters of Painting, The Museum of Fine Arts, Houston, 1950, no. 20, as by Hans Holbein the Younger. Die Malerfamilie Holbein in Basel, Kunstmuseum, Basel, 1960, no. 92, as by Ambrosius Holbein. Dürer-Cranach-Holbein. 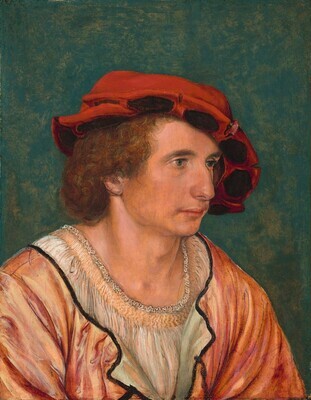 Die Entdeckung des Menschen: Das deutsche Porträt um 1500, Kunsthistorisches Museum, Vienna; Kunsthalle der Hypo-Kulturstiftung, Munich, 2011-2012, no. 80, repro. (shown only in Munich). The portrait is painted on a single piece of linden with vertically oriented grain, and it has been cradled. The panel has been thinned and scored on the reverse in a diamond-shaped pattern. The presence of a barbe along all four edges strongly suggests that the panel was painted in an engaged frame. Over the smooth white ground there is a thin layer of a warm pink paint that is visible under the blue background and seems to have been deliberately used to moderate the background color. It is likely, although not verified, that the pink imprimatura is under the figure as well. Underdrawing in the face and hat, apparently executed with a brush, is visible with both the naked eye and infrared reflectography. A curving crack traverses the length of the panel. There is an associated straight crack, which merges with the curved crack just above the sitter's eyes. There are minor damages to the unpainted borders, including a small loss in the lower right corner. As a result of movement in the panel, there are losses in the ground and the pink imprimatura and corresponding losses in the paint layer. These losses are skillfully inpainted. There is scattered abrasion throughout, and the background has been lightly retouched. Baldass, Ludwig. "Ein Frühwerk Hans Holbeins des Jüngeren." Kunstchronik und Kunstliteratur. Beilage zur Zeitschrift für bildende Kunst. 7/8 (1931): 61-62, repro. "A Plan for Loot: Blue-Prints for a New `House of German Art'." The Illustrated London News (7 July 1945): 25, repro. Schmid, Heinrich Alfred. Hans Holbein der Jüngere: sein Aufstieg zur Meisterschaft und sein Englischer Stil. 3 vols. Basel, 1948: 1:69. Hugelshofer, Walter. "Die Anfänge Hans Holbeins des Jüngeren als Bildnismaler." Phoebus 2 (1949): 60, 67-70, repro. Paintings and Sculpture from the Kress Collection Acquired by the Samuel H. Kress Foundation 1951-56. Introduction by John Walker, text by William E. Suida and Fern Rusk Shapley. National Gallery of Art. Washington, 1956: 106, no. 38, repro., as by Hans Holbein, the Younger. Paintings and Sculpture from the Samuel H. Kress Collection. National Gallery of Art, Washington, 1959: 308, repro., as by Hans Holbein, the Younger. Broadley Hugh T. German Painting in the National Gallery of Art (Booklet no. 9 in Ten Schools of Painting in the National Gallery of Art, Washington, DC). Washington, 1960: 10, 36-37, color repro. Baldass, Ludwig. "Offene Fragen auf der Basler Holbein Ausstellung von 1960." Zeitschrift für Kunstwissenschaft 15 (1961): 87, repro. 88. Walker, John, Guy Emerson, and Charles Seymour. Art Treasures for America: An Anthology of Paintings & Sculpture in the Samuel H. Kress Collection. London, 1961: 90, 212, color fig. 82. Summary Catalogue of European Paintings and Sculpture. National Gallery of Art, Washington, 1965: 69, as by Hans Holbein, the Younger. Grohn, Hans Werner. "Holbein, Ambrosius." In Kindlers Malerei Lexikon, edited by Germain Bazin, et al. 6 vols. Zürich, 1964-1971. Zürich, 1966: 3:260. European Paintings and Sculpture: Illustrations (Companion to the Summary Catalogue, 1965). Washington, 1968: 60, no. 1381, repro. Salvini, Roberto and Hans Werner Grohn. L'opera pittorica completa di Holbein il Giovane. Milan, 1971: 87-88, no. 15, repro. Cinotti, Mia, ed. The National Gallery of Art of Washington and Its Paintings. Great Galleries of the World. Edinburgh, 1975: unpaginated, no. 96, repro. European Paintings: An Illustrated Summary Catalogue. National Gallery of Art, Washington, 1975: 178, 179, no. 1381, repro. Walker, John. National Gallery of Art, Washington. New York, 1975: 158, no. 176, repro. Young, Eric. Review of Eisler, Colin. Paintings from the Samuel H. Kress Collection: European Schools Excluding Italian. (Oxford, 1977). In The Connoisseur 195 no. 784 (June 1977): 153. Walker, John. National Gallery of Art, Washington. Rev. ed. Washington, 1984: 158, no. 170, color repro. as by Hans Holbein the Younger. European Paintings: An Illustrated Catalogue. National Gallery of Art, Washington, 1985: 205, repro. Rowlands, John. Holbein. The Paintings of Hans Holbein the Younger. Complete Edition. Oxford, 1985: 237, no. R.42, fig. 250. Hand, John Oliver, with the assistance of Sally E. Mansfield. German Paintings of the Fifteenth through Seventeenth Centuries. The Collections of the National Gallery of Art Systematic Catalogue. Washington, 1993: 98-102, color repro. 99. Löcher, Kurt. Review of German Paintings of the Fifteenth through Seventeenth Centuries, by John Oliver Hand with the assistance of Sally E. Mansfield. Kunstchronik 43 no. 1 (January 1995): 17. Sander, Jochen. Hans Holbein D.J. Tafelmaler in Basel 1515-1532. Munich, 2005: 224, 247, 249-251, 422, 466, fig. 194, color fig. 60.